I joust you not. 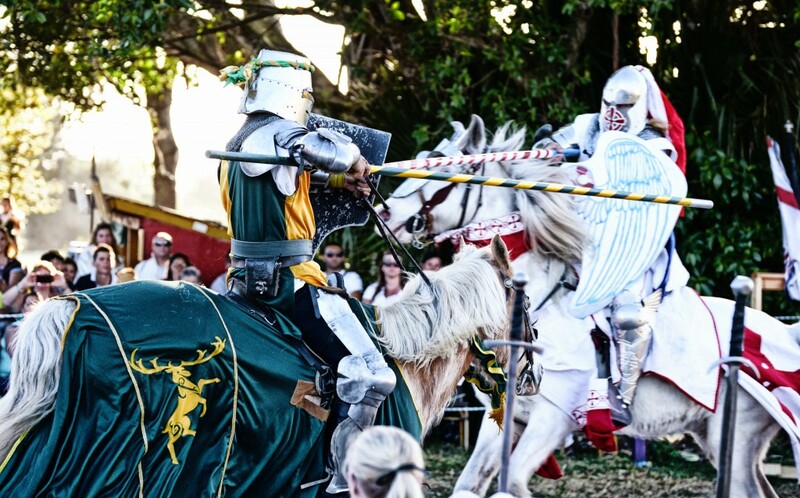 But if it’s jousting you want to see, come to the 24th annual Florida Renaissance Festival at Quiet Waters Park in Deerfield Beach. The Festival opens Saturday, Feb. 13 and continues for an unprecedented seven weekends through March 27. For this year’s event, producer Bobby Rodriguez has chosen the theme “Renaissance Around the World.” As always there will a full complement of 100 16th century costumed performers on 12 stages featuring 20 acts from around the world, performing acts of dexterity, low and high comedy, juggling, minstrel music, sword fighting, horseback jousting, pirate high jinks and aerial acts. The Renaissance Festival is the brainchild of Bobby Rodriguez, who is a working musician, bandleader and head of his own talent agency. Rodriguez says he is bringing back by popular demand the rare, massive carillon instrument of bronze bells. As part of the Voyage to the Orient, there will be dragon boat races on the Quiet Waters Lake. Themed weekends are as follows. “Swashbucklers & Sirens” Feb. 13-15. “Vikings & Valkyries” Feb. 20-21. “Fantasy and Adventure” Feb. 26-28. “Voyage to the Orient” March 5-6. “Kilts & Colleens” March 12-13. “Time Travelers’ Weekend” March 19-20. Hours are 10 a.m. until sunset. Tickets are $21 adults and $9 children 6-11 years (under 5 free). Season passes are $75. Call 800-3-REN-FES or go to www.ren-fest.com.